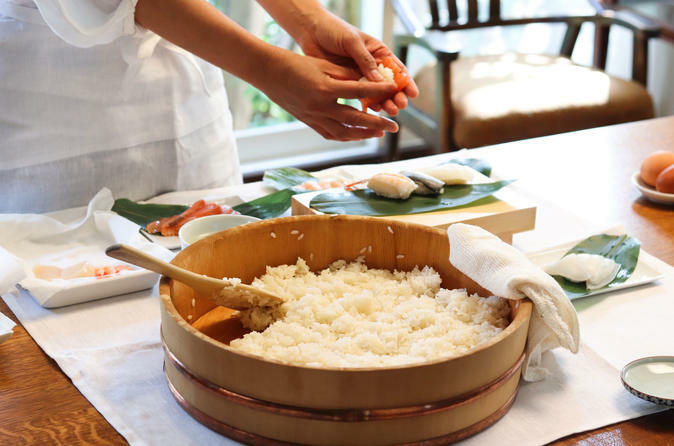 Join your host Junko in her kitchen for a hands-on sushi making lesson. Learn to make a variety of sushi including nigiri (hand-pressed), maki (bamboo-rolled) and temari-sushi (balled). In addition, you will also learn to prepare miso soup from dashi stock and a side dish such as chawanmushi, steamed savory egg custard, a typical dish that locals eat with sushi. During this interactive class that offers detailed explanations of sushi-making, you will be armed with the knowledge to make sushi back home. Your cooking class will last about 1-1.5 hours before you sit down together and enjoy the meal you helped prepare with Junko over delightful conversation. Join Junko and leave with a full stomach, new cooking skills and a heart full of memories to share with your loved ones back home! A passionate food lover, Junko worked for many years in the food industry as a manager and relishes the opportunity to introduce her guests to Japan's cultural and culinary traditions. Junko lives with her family in a clean and cozy home located in one of the most luxurious and peaceful residential areas of Tokyo. Self-described foodies, each member of her family loves to cook and eat together. Junko delights in preparing fresh, healthy meals using locally sourced seafood, vegetables and ingredients. She is passionate about teaching Traveling Spoon travelers how to best make classical sushi at home easily. Having worked at a sushi restaurant, Junko has learned the techniques involved in sushi making and believes that it is actually rather simple and not too difficult if you have a grasp of the basics which she is eager to share. You will sense her pride as she shares interesting stories that highlight the traditions and science behind the seafood and sushi you will enjoy at her table.